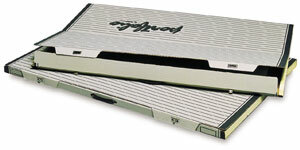 These durable files offer outstanding versatility for storing or transferring large, flat materials. They're excellent for both carrying and shipping artwork, blueprints, maps, and other oversized documents. Small, for sheets up to 24" × 36"
Large, for sheets up to 30" × 42"
Safco's Portable Art and Drawing Files also stack, with or without shelving, to become drawers in an economical storage system. They allow fast retrieval and are equally useful for active and inactive materials. Each file features a sturdy ¾" × 1½" (19 mm × 38 mm) wooden frame, housed in a protective, corrugated fiberboard shell. The exterior is light brown, with a large printed labeling grid. Two metal turnbuckles secure the top, and a reinforced plastic handle aids in carrying. Files are shipped fully assembled. Available in a small and large sizes. Shipping Note — Lead time is currently 4–6 weeks because the items are made to order. Small File, Sheet Size 24" × 36"
Large File, Sheet Size 30" × 42"